Moraira villa in Moraira - VILLA SHANGRI-LA in Moraira: Holiday Villa in Moraira Costa Blanca with Pool. Holiday Villa in Moraira Costa Blanca with two bedrooms 10X5 m Pool, big and lush garden, SAT TV, located in a quiet area with spectacular sea and panorama view. Moraira town This charming place was once a very small fishing village with few inhabitants. Thankfully, the area does not have any high rise hotels and does not feature in the large Travel brochures. The whole area has one of the best climates in the world and has attracted settlers from all over, including the larger cities of Spain. Although there is still a fishing harbour, the village itself has grown and now sports a large marina and numerous restaurants and cafes. Most mornings there are auctions in the fish market and on Fridays there is a street market. This starts early and closes up around 1-2 pm. Finding a car parking space is the biggest problem on Friday mornings! Best idea is to leave the car short of the village and walk in. The Banks and shops are all busy on market day. There is a Sunday morning car-boot sale beside the large petrol station just as you leave Teulada. This also starts early and finishes up around 1 pm. All the surrounding towns and villages have separate market days. Altea is on Tuesdays and this is worth a visit, the market stretches along the sea front with lots of stalls. A word of caution - keep tight hold of valuables, watch wallets in back pockets and handbags slung over shoulder etc. There are some lovely beaches round about the Moraira area [and for 15 miles in either direction - take your pick!]. The Moraira beaches are quite sheltered and good for family bathing. There is the usual beach-bars etc. Round the bay from Moraira there is a superb beach at El Portet also with bars and restaurants alongside. 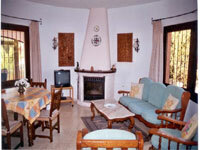 Moraira is situated on the east coast of Spain, at the northern end of The Costa Blanca. 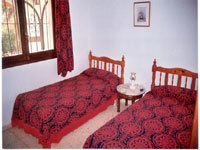 It is approximately 100 km from Valencia (to the north) and 80 km from Alicante (to the south). Both these cities have airports with many flights from the UK (Alicante has the most). Stretching from Alicante in the south to the uninterrupted 10km expanse of sandy beach at Gandia in the north, the Costa Blanca has a coastline with impressive cliffs, rocky coves and beautiful sandy beaches. 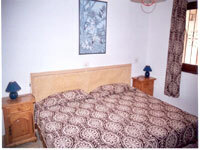 Close inland, rugged mountains rise up and provide easy escape from the busy tourist spots to quiet mountain villages. 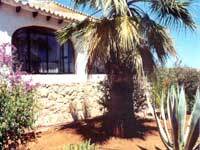 The Costa Blanca enjoys a wonderful climate, being neither too hot in summer or too cold in winter. The coastal road from Alicante to Moraira is especially scenic; this brings you through Calpe where wild flamingos can be viewed on the salt flats. For a good day out take a car trip through Jalon Valley and stop off for lunch at one of the restaurants, favourites are Pepe's, Beni Rossa and La Solana but there are others. Travelling inland it is well worth going through the Jalon Valley. This is agricultural country with almond/orange and lemon groves. The road can be quite narrow in places, especially through some of the villages. There are bodegas where you can have a wine tasting and purchase supplies at good prices. Try the local muscatel. There are mountain passes through the Valley which take you to Altea or Benidorm. Although the routes are very scenic the roads can be narrow and the mountains high. A camera is essential on these trips. Guadalest is a notable place of interest. This is a walled village high up in the mountains and the scenery is breathtaking.Through the Jalon valley there are beautiful mountain waterfalls and natural swimming pools called Cascada de El Algar or Fuentes D'Algar and these, as well, are worth the trip [take plastic shoes for paddling in]. For watersport fans Aqualandia Benidorm is an excellent day out. sessions and prices, good for kids. Also don't miss TerraMitica, the new 'mythical' theme park near Benidorm. 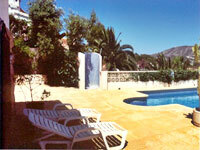 For great beaches and a good day out, try Calpe, Altea, (and Benidorm-great beach!) to the south or Javea, Denia, Oliva and Gandia to the north. Also, go inland to the north (90 minutes) and visit the beautiful medieval town of Jativa with stunning buildings and scenery together with a punishing hill climb for those fit enough! Restaurants For eating out there is a wide choice, not only in the town but in the surrounding area as well. Some places to note are: Huang Zhou Chinese restaurant which is on the coast road leaving Moraira towards Calpe, not too far from the village. Practically next door is the Steak House where either beef or pork steaks come raw with a heated 'stone' to let you cook it yourself. Wine is not included but the bill usually works out around UK pounds 10 per head. Good English food can be found at both El Cid and Captain Benbows in the town. There are lots of others, all worth trying, usually the prices are displayed. Another good restaurant is Tico~Tico which is also on the coastal road from Moraira to Calpe quite far up, past a big Pepe Ia Sal Supermarket. It is signposted just after this shopping area and calls for a very sharp right hand turn to find the restaurant. An excellent 3 course meal can be had for the equivalent of £8 per head and this includes wine. A great bar and restaurant exists in Teulada called The Avenida bar, excellent tapas snacks at the bar or alternatively try the restaurant in the rear of the premises. Moraira villa in Moraira - VILLA SHANGRI-LA in Moraira: Holiday Villa in Moraira Costa Blanca with Pool..